This beer was produced to commemorate the disbandment of XV Squadron after 102 years of dedicated service. Aim Sure. Good malt flavour is balanced with fruit hop and a hint of chocolate providing gentle bitterness on the finish. OUT OF STOCK. The name is testament to the Squadron’s most famous aircraft ‘MacRobert’s Reply’. The first ‘MacRobert’s Reply’ was a Short Stirling bomber, serial N6086 operated by XV(R) Squadron in 1941. The aircraft was paid for by a generous £25,000 donation from Lady Rachel Workman MacRobert, and was named ‘MacRobert’s Reply’ in commemoration of her three sons, all of whom were killed whilst serving with the RAF. 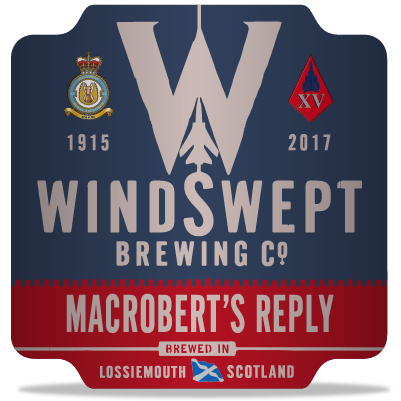 Four other aircraft have since carried the name ‘MacRobert’s Reply’, and borne the MacRobert family crest.